Know About Your Pool Repairs! Pools are complex machines; they require a network of filters, pipes, and pumps to work properly. With the complexity of the system, it may come as no surprise that something can break or eventually need to be fixed. Pool equipment, plumbing, and even decking may need fixing at some point. And, when this time comes, you will want to know you have the best pool maintenance team on your side. AmeriTex Pool Services is a local Houston, Texas, pool restoration company. We assist local residence with pool maintenance cleanings, chemical mixtures, repairs, and restorations. With our help, your swimming pool can receive the attention it needs in order to run smoothly all year long. In this blog, we will discuss some of the main repairs you may face as a swimming pool owner. Hopefully, by being able to identify what repairs you will need, you can call your local swimming pool maintenance service to help you. Pool equipment can range from machinery, pumps, to even motors. In order to keep your pool clean and safe, your machinery must be functioning properly. You will be able to tell if your pool is not functioning correctly by the color of the water. Without pumps and motors, the filtration of the pool’s water will become stagnate and develop algae. The algae, in turn, will change your pool’s water from a blue color to an ugly, murky green. Another way you will be able to tell when these systems aren’t working is by hearing for the machines. If you hear screeching or grinding noises coming from your filtration system, you must look for leaks or rust. Pool plumbing is different than your kitchen sink’s plumbing system. Because they are two different types of systems, with varying parts and machinery, you need to call a pool plumbing service. A swimming pool plumbing service will be able to inspect your pool’s pipes in order to determine if there is a leak or a blockage. Hair and debris can clog up the system and render the filtration system useless. Without a working filtration system, as stated above, your pool can develop algae and the water in your pool won’t be able to filtrate throughout the whole pool. Why does this matter? Well, if you have a heated pool, this means that the warmed water won’t move throughout your pool’s area, which will leave some parts colder than others. Replastering shouldn’t happen often, especially if you are taking good care of your pool. For instance, replastering is needed if your pool’s side is faded, stained, rough, or peeling. These things can occur if your pool is not chemically balanced properly or if debris has been left at the bottom of your pool. The best way to prevent stains or damage to your pool is to regularly clean your pool and maintain its chemical balance. Swimming pool chemical maintenance is a service that AmeriTex staff members are expert on! With our help, we can ensure that your pool is getting the right amount of chlorine to ensure that it is clean and damage-free. If you have any additional water features will your pool, such as water jet streams, fountains, and scuppers, we can help. Sometimes, these extra features can break or need to be repaired. Without them, the aesthetic and full-experience of your pool can change. With our staff, we can help improve your pool’s value by fixing your added water features. Pool decking repair can be necessary if your pool has withstood a leak or a crack. This sort of damage is rare, but does happen. Natural disasters, such as Earthquakes, can shift your pool and essentially break the concrete casing of your pool. If this happens, you may not notice right away, depending on the size of the crack or leak. If you notice the water level of your pool has dramatically gone down, you will need to hire a professional pool service to drain, inspect, and seal your pool. 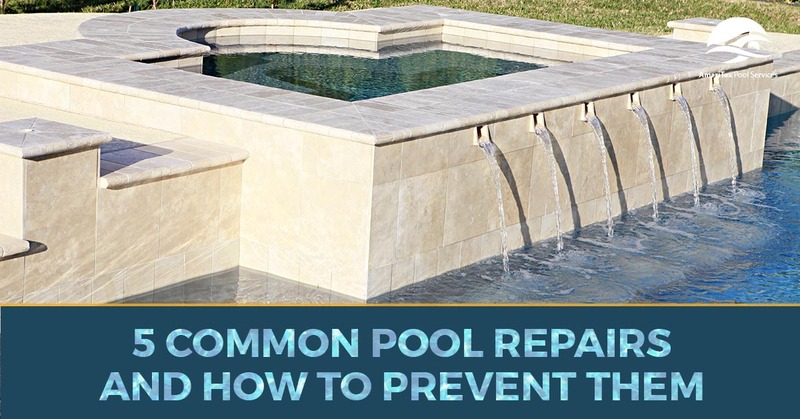 Depending on the amount of damage sustained, your pool may also need to be replaced. If your pool decking has been damaged, you also may want to inspect your pool as well. Though your pool deck is not directly related to your pool, it is still an essential part of your inground swimming pool. To maintain and repair your pool decking, calling a professional service is recommended. At AmeriTex Pool Services, we are dedicated to the residents of Houston, Texas. Because we live in such an agreeable climate, many homeowners own swimming pools. Because pools require maintenance throughout the year, sometimes homeowners need assistance keeping up with their swimming pool’s demands. That is where we come in! Contact us today if you are interested in our services.